Located 20 miles to the north of Dallas, Lewisville offers its more than 95,000 residents easy access to all of the attractions in the Dallas-Fort Worth Metroplex from the comfort and security of well-planned neighborhoods. From the historic homes around Old Town to the new communities of Vista Ridge Estates, each neighborhood has its own unique features and charms. Many Lewisville homeowners improve their properties with the addition of backyard amenities like swimming pools and enlist help from the pros at Texas Fiberglass Pools Inc. to keep them operating well and looking great. From Lewisville fiberglass pool repair, fiberglass pool resurfacing to pool maintenance, our team of pool contractors lets you get the most out of your backyard oasis while saving you thousands of dollars in repair and replacements costs. Ensuring that your swimming pool or hot tub in Lewisville is safe for your family and friends to enjoy takes regular maintenance, not only for the pool itself but for the deck area as well. At Texas Fiberglass Pools Inc., our Lewisville fiberglass pool repair deck resurfacing, plumbing repair, and coping replacement services help prevent mishaps while enhancing the style of your outdoor activity space. Serving the Dallas-Fort Worth Metroplex since 1995, we have the experience and expertise to tackle a wide array of projects in Lewisville, including: custom pool installations, baptistery resurfacing, hot tubs, pool leak detection, pool plumbing repairs and more. 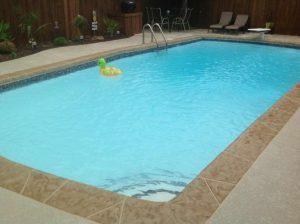 Texas Fiberglass Pools Inc. is the company to call for fast and effective solutions. Looking to rejuvenate and renovate an aged pool with new coping or tile? If so, you can count on the coping and tile repair and replacement services available through Texas Fiberglass Pools Inc.. Our coping and tile services involve a team of expertly trained specialists, whose goal is to provide you with a seamless and beautiful outer surface for your pool or hot tub. Our Lewisville fiberglass pool repair team will install, repair, or replace the protective capping over your pool’s walls and edges with various materials: tiles, fiberglass, stones, and more. You will find an amazing selection of colors and styles to create a customized, beautiful, and luxurious outdoor oasis that will be both visually appealing and act as protection to maintain the pristine lining of your pool, for many years to come. For a free consultation or to request a service, Contact Us Today!